You can sink your claws into an exposition devoted entirely to cats at Rotterdam’s Kunsthal museum, until January 14, 2018. ‘Cat Love: Nine Lives in the Arts’ takes a look at how felines have been depicted in art from the mid-19th century to modern times. 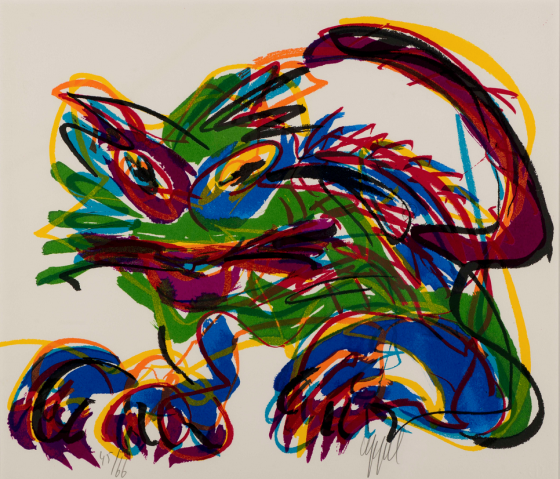 Along with paintings by Henriëtte Ronner-Knip and Théophile-Alexandre Steinlen and work by contemporary artists including David Shrigley and Wallasse Ting, the show includes tributes to international ‘cat sensations’ like Grumpy Cat and Lil Bub. There’s also an interactive exhibit that allows visitors to experience what it’s like to be a feline in the Netherlands. What does that entail exactly? You can learn more here. There seems to be a museum for just about everything in Amsterdam and that includes cats. Located on the ground floor of a canal house along the Herengracht, Het Kattenkabinet features feline-related works by artists including Rembrandt, Toulouse-Lautrec, and Picasso. It was founded by curator Bob Meijer in 1990 partially as a tribute to his dearly departed cat John Pierpont Morgan. But that’s not the only place where you’ll encounter cats in Amsterdam museums. 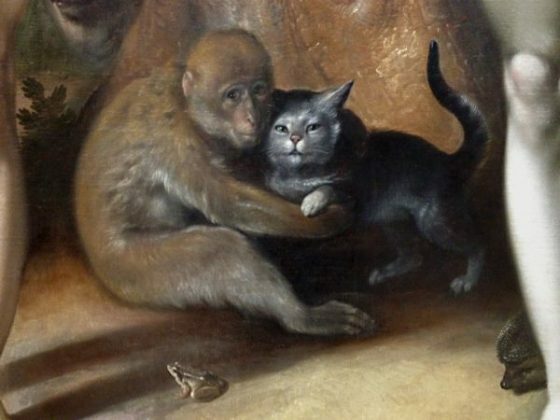 Cornelis van Haarlem’s The Fall of Man, at the Rijksmuseum, includes a curious depiction of a small monkey hugging a grey cat. The meaning behind this unusual pairing in the 1592 masterpiece could be a reference to an old folk expression, or a parable that’s been lost to the ages. Cats can also be found in plenty of other paintings throughout the museum and, according to its website, they can be interpreted as metaphors for everything from lust and greed to strength and speed. But aren’t cats supposed to be afraid of water? De Poezenboot has been an Amsterdam landmark since the late 1960s. 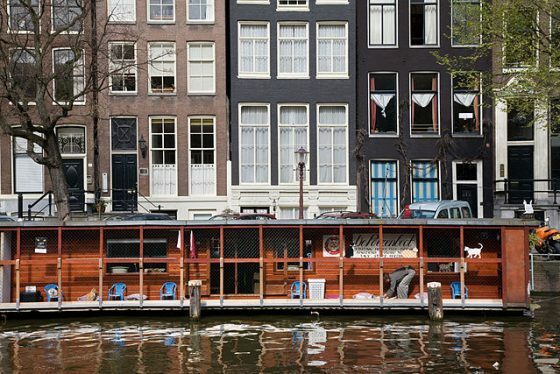 This sanctuary for abandoned and stray cats is located on a houseboat along the Singel. It was founded by Henriette van Weelde, who discovered a family of felines living under a tree near her floating home on the Herengracht in 1966. She adopted them and they were soon joined by additional strays. 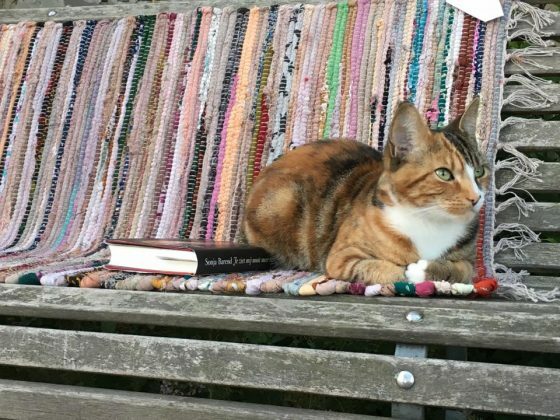 As more and more cats were drawn to her house, Van Weelde eventually transferred them to an old sailing barge that was retrofitted to be more cat-friendly. Since then, De Poezenboot has moved into a different houseboat and it’s helped rescue countless cats-in-need. You can learn more about the non-profit organisation by clicking here. While the cats that live on De Poezenboot peacefully reside on the waters of one of Amsterdam’s most picturesque canals, other felines around the country aren’t so fortunate. Tragically, cats drowning in canals is a fairly common occurrence. This is why organisations including Leiden’s Kat uit de Gracht project have sought to develop unique ways to rescue felines that have run afoul of the nation’s waterways. Cat cafes continue to be something of a phenomenon in Asia, where cat-less residents living in tiny apartments in cities like Tokyo don’t have enough space to accommodate a furry friend. So instead they get their ‘feline fix’ while sipping a coffee or enjoying a slice of cake in a restaurant with half a dozen (or more) of them running around. While it’s easy to encounter a ‘cafe cat’ in any number of eateries, especially in Amsterdam, the Netherlands does have at least two that are fully devoted to them. At the time of writing, Pebbles Kitty Cat Cafe in Rotterdam had eight cats on staff, each one adopted from a local shelter. There’s also Kopjes in Amsterdam, which has seven. Much like similar businesses overseas, both cafes have an entrance fee and a list of rules that their clientele are expected to follow in order to help keep their furry employees happy and healthy. 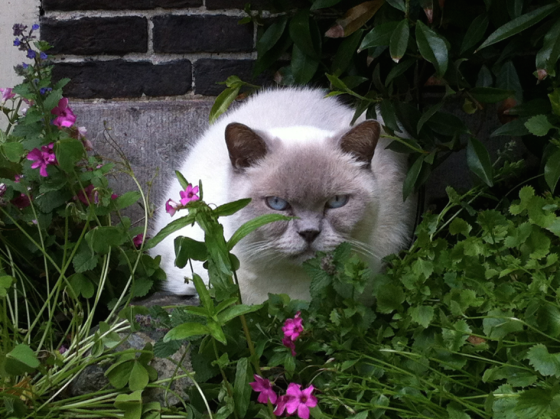 The most famous cat in the Netherlands? In Dutch, a ‘kater’ is a term for a hangover as well as a male cat. It’s also the nickname of a beloved cartoon character from the long-running comic strip series Jan, Jans en de Kinderen that’s probably the most famous cat to ever come out of the Netherlands. The Rode Kater’s real name is Edgar Allen Poes and he belongs to the Tromp family. Unlike his fellow cats, Edgar is a pacifist that refuses to hunt mice. He is also a bit of a philosopher and offers the reader his opinions on various real-world events and topics. Edgar was inspired by Kobus, a real cat that once belonged to the strip’s creator, Jan Kruis, who died earlier this year. He is now drawn and written by other artists. Over the years, the still popular strip has been translated into multiple languages and has spawned animated films, songs, comic spin-offs, tons of merchandise, an anti-smoking campaign, and even a stage musical. Real cats in the Netherlands have also gained substantial levels of notoriety. Buurtpoes Bledder, a tomcat that belonged to a student house in central Leiden, became a regional celebrity after he started hanging around nearby businesses and cafes. A clerk at a record shop decided to create a Facebook account to track his whereabouts that inevitably resulted in his own Wikipedia page as well. After Bledder was killed by a motorist in 2013, his death was reported in media outlets including the Leidsch Dagblad and the national television network SBS 6. 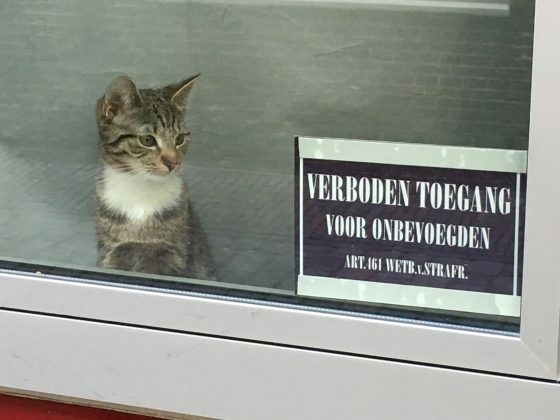 Tram-Poes, another sadly deceased feline, became a celebrity in his own right while he spent a decade frequenting a tram stop near his home in Rotterdam. Anti-Islam politician Geert Wilders, notoriously shy of appearing on Dutch tv chat shows, was happy to appear on one this year to talk about his two cats who have their own Twitter account and 9,000 followers. The Cats was the name of a popular Dutch rock band that was founded in Volendam back in 1964. They’re perhaps best known for their hit single ‘One Way Wind’ that became a top 10 hit in countries all across Europe and beyond in the early ‘70s. 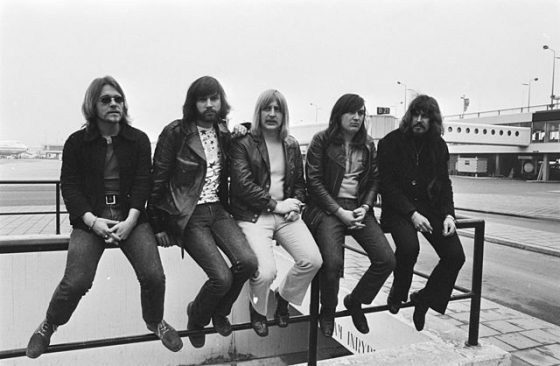 The band called it quits in 1979 but reformed briefly in the mid ‘00s to record a single for a greatest hits album and be inducted into the chivalric Order of Orange-Nassau. There’s plenty of places in the Netherlands where you can buy cat toys but one shop in Amsterdam’s Jordaan district is completely focused on felines and their human companions. At Cats & Things, shoppers, both furry and less so, can find tons of supplies for cats in addition to feline-related home accessories. They also host training and educational seminars. Interested in signing up? You can keep track of the store’s schedule via its ‘MIEUWSmail’ newsletter.